It Should Be Simple Right? To date, there is no common consensus as to the dynamics of passivation. What is agreed upon is that iron contamination on the surface of the stainless steel will oxidize and begin the degradation processes on the contamination itself, then upon the surface lattice of the metal. Effective passivation requires proper cleaning of the stainless steel followed by the removal of all free iron contamination from the surface. This contamination may come from forming, stamping, machining, cutting, grinding, iron dust, etc. To make matters worse, the contamination is not often visually apparent but only present on a molecular level. Here is where we stand up and yell, “Hold on! Stainless steel forms a passive layer naturally!” Once the chromium (and nickel) in the metal come into contact with oxygenated air, their oxides form. So why do we need any extra steps to do what nature does without any help at all? Blame it on the iron contamination. Nature makes sure that the iron rusts immediately upon contact with air and/or water. Once started, only a passivation treatment will stop the “infection” and reverse the exposure. In essence, passivation is absolutely necessary in order to maximize the natural corrosion resistance of the stainless steel. There are three primary passivation categories. (Exhibit B.) This paper will only address the first two. Nitric acid has been the preferred passivation system for the longest time due to QQ-P-35, the governmental specification for passivation until 2005 when it was replaced by ASTM A967 that allows the “old” nitric passivation and the “new” citric passivation. Nitric Acid Passivation – Nitric acid passivation processes are offered either with or without sodium dichromate at varying temperatures, chemistry compositions and exposure times. The specific processes are dependent upon the material grade of the stainless. Citric Acid Passivation – Citric acid passivation processes are offered at varying temperatures and pH ranges. The specific processes are also dependent upon the material grade of the stainless. Electropolishing – Electropolishing is an electro- chemical process used to polish a metal surface by removing a microscopic amount of material from the surface of the metal. It more accurately conditions, rather than passivates the surface, but a part that has been electropolished requires no subsequent passivation. The concept of passivation of stainless steel with citric acid was originally developed in the beverage industry by the Coors Brewing Company.2 Iron in the containers created an unacceptable taste in the beer, and the existing nitric passivation system could not provide the degree of passivation required. The move to citric acid has also advanced, in part, due to the more stringent EPA and OSHA regulations governing the use and treatment of nitric acid and its waste. For more comparisons between the passivation systems of citric acid and nitric acid, please refer to Appendix I. 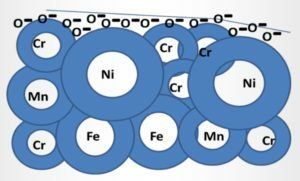 The ASTM specifications provide five tests to determine the presence of a successful passivation layer.3 However, these tests only determine whether or not free iron is present. The absence of free iron does imply a viable passive layer, but it does not tell anything else. AES – Auger (pronounced au-zhā) Electron Spectroscopy. This destructive test provides an actual thickness measurement for the passivation layer. In conclusion, no matter whether it can be seen or not, no matter its origins, the most probable presence of any iron contamination on the stainless steel must be removed by chemical passivation. This is absolutely critical for the formation of the uniform, but ever so thin chromium-rich oxide layer that protects the stainless steel substrate from attack from the elements. Though nitric acid has been the traditional passivation acid of choice for years, more and more new specifications allow for the use of citric acid. Citric acid gains more ground in industry because it is friendlier to the environment, friendlier to handle and can bring about the passive layer in less time than nitric acid and its formulations with sodium dichromate. While citric acid gains in notoriety, some vendors are welcome to continue providing nitric acid passivation instead of or in addition to citric acid if they are already set up for it and using it in conformity with the specifications. There may be no compelling need to change as long as they are providing good results and service. And no matter how excellent the proof that citric acid can provide a chromium-rich passive layer as well as or even better than nitric acid, some people just are not willing to make the change. And there is nothing wrong with that. ASTM A967 Meets requirements. Meets requirements. AMS 2700 Meets requirements. Meets requirements. ASTM A380 Meets requirements. Meets requirements as referenced in ASTM A967. AMS QQ-P-35 Meets requirements as referenced to AMS 2700 & ASTM A967. Now referenced to AMS 2700 & ASTM A967. Passivation Excellent for most grades of stainless steel. Excellent for most grades of stainless steel. Passivation Duration 30 minutes to several hours. 5-20 minutes, typical. Maintenance Regular solution monitoring is recommended. Regular solution monitoring is recommended. Cost Low cost for raw material though high for shorter usefulness of the solution. High cost for maintenance & disposal. High cost for sufficient ventilation. Higher raw material cost though longer lasting baths & lower concentrations of chemicals needed. Lower maintenance, safety & waste disposal costs. Temperature Extremely dangerous at elevated temperatures. Elevated temperatures expedite the process & is safe without ventilation. 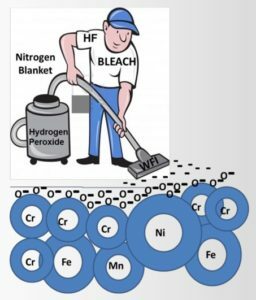 Iron Oxide Removal Slowly removes iron oxides by dissolving them. Readily removes iron oxides by chelating them within the acid structure. Other Removal Given enough time, Nitric Acid etches stainless steel metal components (including the chromium & nickel). Citric Acid ONLY removes free iron. Nothing else. Equipment Long term corrosive degradation of containers. No corrosive degradation of equipment. Bath Contamination High iron concentration may cause rinsing issues. Algae or bacteria could bloom in the bath. Process Stability Must control time & temperature closely as danger of nitric oxide gas exists. Good ventilation is required. Less prone to time & temperature variations. No hazardous vapors. Safety Hazardous handling required. Safe to use as directed. Air Emits toxic NOx gases. No toxic fumes. Ease of Use Chemical handling safety equipment & extreme care are required. Little to no special safety equipment is needed. Waste Treatment Acid neutralization, nitrate monitoring, heavy metal precipitation, possible hexavalent chromium removal, sludge removal, corrosive atmosphere, dangerous handling. Acid neutralization. Preferred Industries Industrial, Pharmaceutical. Medical, Food & Beverage, Pharmaceutical. British Stainless Steel Assocation: Making the Most of Stainless Steel. Kremer, Lee V. 2006. Surface World: Surface Preparation & Cleaning Improvements in passivation using citric acid formulations. For referenced ASTM standards, visit the ASTM website www.astm.org, or contact ASTM Customer Service at service@astm.org. Modern Machine Shop: How to Passivate Stainless Steel Parts. Link. Carpenter: Passivating and Electropolishing Stainless Steel Parts. 2007. Link. Disclaimer: This White Paper is issued for information only. The views expressed are entirely those of the author. Allegheny Surface Technology declines all responsibility for any errors and any loss or damage resulting from use of the contents of this White Paper. Allegheny Surface Technology also declines responsibility for any infringement of any third party’s Intellectual Property Rights (IPR), but will be pleased to acknowledge any IPR and correct any infringement of which it is advised. All rights reserved.